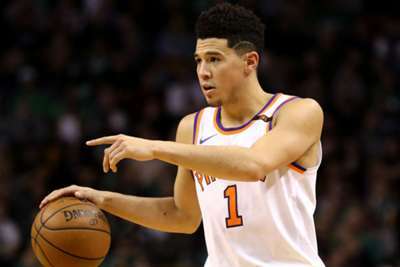 Devin Booker will be back on the court when the Phoenix Suns begin the NBA regular season, according to head coach Igor Kokoskov. Suns guard Booker underwent hand surgery in mid-September and was expected to miss about six weeks. But Booker healed quicker than first anticipated as the 21-year-old was cleared for full contact last weekend. Kokoskov said Booker will play against the Dallas Mavericks in the season opener on Wednesday. "There's no secret," Kokoskov said via Arizona Sports 98.7FM. "He's ready, he's playing, he's excited. He's our big rock. "Devin is doing great. … He's in a good place. Very vocal, very active, looks healthy." Booker signed a five-year, $158million contract extension with the Suns this offseason. He was selected by the Suns out of Kentucky with the 13th pick in the 2015 draft. Booker averaged a career-high 24.9 points and shot 38.3 per cent from 3-point range in 54 games last season.